Locust Grove began their shift to blended and personalized learning with a planning year in 2014-2015. During that year, they collected and analyzed multiple forms of data, such as standardized test scores, grades, graduation rates, and feedback from students and stakeholders. This data highlighted three specific needs: their students were not prepared for high school, and they wanted more access to teachers and to technology. After recognizing a need for change, Locust Grove started to investigate other schools that provided different types of teaching and learning. After extensive research and multiple school site visits, educators at Locust Grove were inspired by a variety of instructional components that could help improve their students’ experiences, including advisory classes, habits of work, and project-based learning. In their first year of personalized learning implementation, Locust Grove created a large lab rotation for half of the school. They created two Assessment Labs by cutting holes between two classrooms and staffed each lab with a paraprofessional. Assessment labs provided students with two hours of computer access each day, during which they usually took formative and summative assessments and worked on online programs prescribed by their content teachers. This allowed Locust Grove to reduce its class size in main content areas, provided teachers with better data on student progress, and gave students more practice on topics introduced during content classes. At the end of the year, Locust Grove saw discipline rates drop and academic performance improve, along with increased student access to teachers and technology. 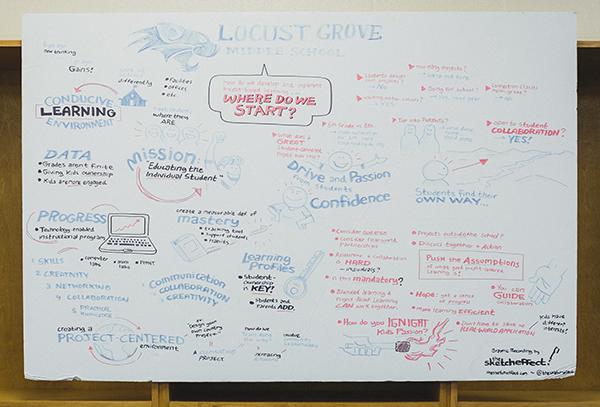 Based on the success of the first year, Locust Grove expanded the breadth and depth of their personalized learning. The large lab rotations were expanded to the entire school, creating improved access to teachers and technology for all students. Locust Grove also began to focus on competency-based education by breaking down district competencies, deconstructing performance indicators (developed by the district), and creating learning targets. This enabled them to create Learner Pathways, further personalizing learning for their students. Locust Grove continues to evolve their personalized practices in their third year, seeking ways to leverage technology to increase student agency and growth.